Having alternate communication devices on hand during a disaster can help maintain some sort of communication, as well as help maintain a sense of self reliance during difficult times. 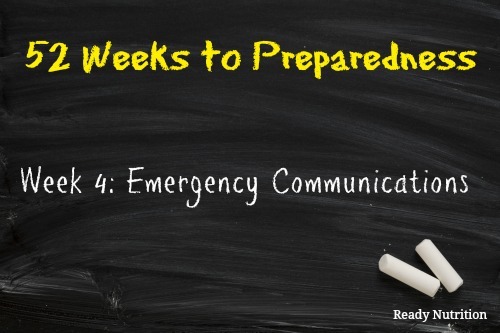 We have all witnessed a “communications down” scenario when going through natural disasters. One thing that all of these natural disasters have in common, besides the disruption of our daily lives, is that they are immediately followed by an almost total loss of the ability to communicate with the outside world. Power is lost, telephone services are discontinued, and cell phone service is either non-existent or is so congested that no one can get through. When experiencing these “communication down” situations we realize how vulnerable and dependent we are on the system that failed. It should be easy to operate. Have a modest amount of protection against interference. Be inexpensive (low initial cost, low maintenance cost and no monthly fees). Be able to operate “off the grid”. Compass and whistle for all members of the family over the age of 6. When a hurricane threatens an area, the city suggests families back up important documents e.g., personal ID, security card, I.D. cards for the kids, proof of residence, insurance information, medical records, bank and account information, and place the documentation in a waterproof container or reasonable plastic bag. Don’t forget to include documentation records for your pets, e.g., IDs, immunization records, and medications. Having this information prepared and set aside will help save precious time when preparing a home for a disaster. The point is magnetic north, that’s how to use a compass. It’s not that hard to learn the basics of using a compass. There are books at the library, instructions online, or you could ask a Boy Scout to teach you. I have a neighbor who has been a hiker for many years and he is willing to help anyone who needs assistance with orienteering. I’m sure there are people like him in lots of locations who are willing to teach. If you should have to leave your familiar surroundings you will need the compass to insure you are heading in the right direction and not towards danger or in a large circle. Don’t forget HAM gear for two way comm or satellite phones (expensive) but not dependent upon the grid..